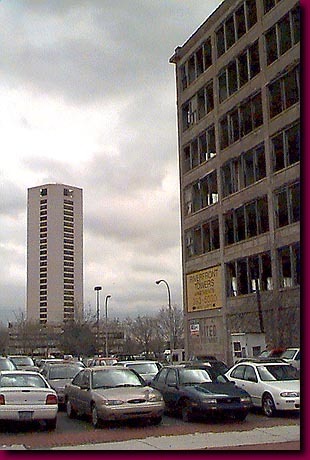 New Development, Cars, Ruins, three deeply interrelated facets of the face of Detroit meet in this image. New meets old along Detroit's west riverfront. In the background, along the river shore, rises one of the towers of the bland but expensive Riverfront Apartments. One of the uses of Detroit's abandoned buildings is as billboards. In an ironic twist, the yellow sign on the side of the shell of the 1250 Fort Street Building touts the luxury Riverfront Apartments. Built in the early eighties, the hugely successful Riverfront Apartments have dispelled the myth that people of means would never again inhabit Detroit. The solution was simple, a dramatic location on the river combined with fortress-like security.